Team in attendance for the 3rd investigation – Mark, Matthew, Jessie, Barbara, Kel, Amy and Ian. Also, there for the first 2 hours was a journalist from Fairfax Media doing an article feature about the team, with accompanying photographer, videographer and 2 assistants. 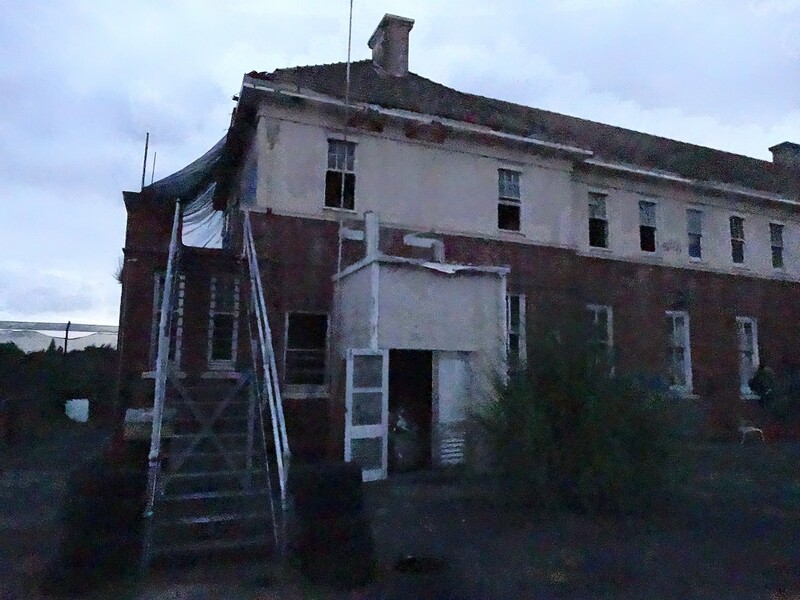 The Haunted Auckland team arrived at Kingseat at 8pm, for our third visit. For this visit we had a lot more equipment as we had managed to obtain permission to hold an overnight investigation. As we had been to this location twice previously, we knew the conditions and building layout so had pre planned the investigation, knowing which areas we would be concentrating on this time round. Splitting up into two teams, the groups set about positioning their equipment which included setting up a 4 camera IR system in the administration building upstairs. Our home base was a room directly downstairs from this. The DVR monitoring station was set up in a large open room upstairs with cabled cameras fanning out into the surrounding rooms. From there we were able to monitor the infrared cams while keeping in touch and co-ordinating all team members by walkie talkie. 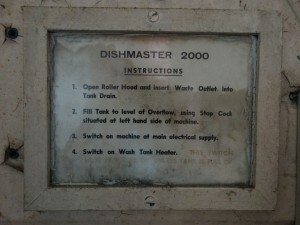 Both buildings were systematically swept for EMF levels (if any). Surface and ambient temperatures were taken in all areas throughout the night to monitor any sudden drops, rises or sudden fluctuations. General atmospheric conditions were continuously monitored throughout the night where possible. Hand held and positioned audio recorders were used throughout the investigation. Full photographic and video coverage of both buildings (interior and exterior), was completed using various cameras, from Go-Pros, static tripod fixed cameras, Time lapse, motion sensor cams, film cameras: digital, Nightshot, full spectrum, UV and Infrared. Communication sessions were attempted and time was spent in all parts of the location, including the single lockdown cells. 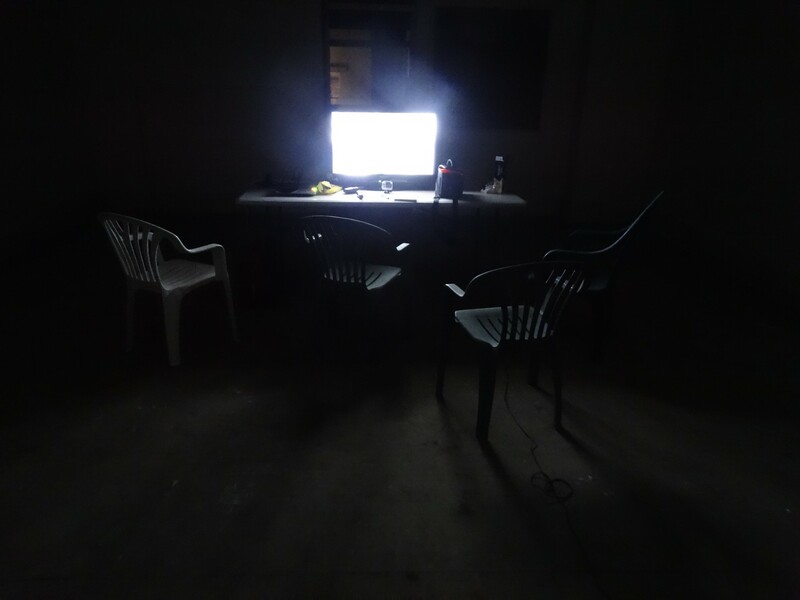 To add more control to the investigation, the teams stayed to their designated building for a period of time, then alternated with the other team to cover more area throughout the night without the possibility of contaminating recordings with audible spill-over or interruptions. Temperatures were collected and noted at the beginning of the investigation. It must be noted that though Barbara commenced taking the temperatures shortly after arrival, it took a good hour or so to walk through both buildings so there is quite a large time difference between the first reading taken in the front building and the last reading taken in the back building. Barbara – Due to the sheer size of the buildings and the sometimes maze-like floor plans of the rooms involved I decided to take initial readings (as baseline readings) and then follow through with later readings in areas where possible activity was detected. The surface temperature in the Administration building ranged between 17.2C in the middle room upstairs (no windows) to 19C in the Armoury. Ambient temperatures in the same building were 20C (in the small store room upstairs –with majority of windows broken) to 27C in the downstairs room we used as our base/store room. 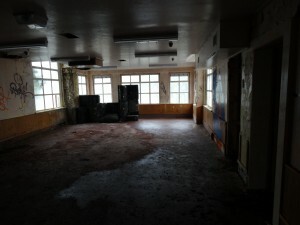 The surface temperatures in the second building ranged from 15.1C in the largest upstairs room (which was lined with windows – some broken) to 17.7C in the room that we named “the hole in the wall room”. Ambient temperatures ranged between 19C in several areas ( “hole in the wall room, end of hallway of “hole in the wall room” and stairway room upstairs) and 17C in the room beside the “hole in the wall room”, the entrance room and the pink bathroom. 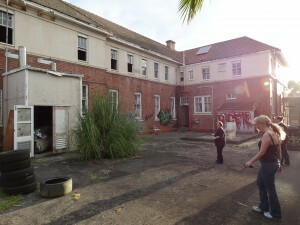 Noted : The team noted that the neighbouring Horror attraction, Spookers was very noisy during this visit. This may potentially have caused audio contamination on our recordings. Laughing, screams and even loud talking could be clearly heard. Amy – It was my second time there so there was actually a feeling of almost comfort, as I knew my way around, so that element of the ‘unknown’ was taken away. The entire second building stood out for me. At one point Barbara and I headed over to it (at about 2am) and I just couldn’t bring myself to enter it. It was like total refusal on my body’s behalf! Not sure if it was a case of being tired by that stage but I definitely could not be convinced to go in. We did go back to it after 3am and I went in for 10 minutes but I still felt really unsure/unhappy about being in there, whereas the other building didn’t inspire any such reaction for me at all. Barbara – I didn’t get any feelings or emotion other than being pleased to be back investigating there. Later in the night I did get a feeling of not being welcome in the back building and felt like something did not want me (us) there. I found it very difficult to actually enter the building at one stage (even though I had been in numerous times earlier in the night and was fine to go in later on in the investigation). 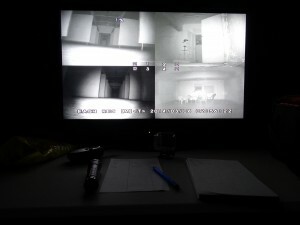 The room that had interested me during earlier investigations was being monitored on the DVR setup so had an infrared camera in it and was being recorded all night from the team base, so I didn’t need to focus too much on that. I did find that whole “hole in the wall” wing interesting. * I felt something “whoosh” through me in the bathroom at the end of the hallway. It was a small room and as I walked into the doorway if felt as if something moved quickly out of the room. * Kel (team medium) also sensed a presence in that area at the same time. 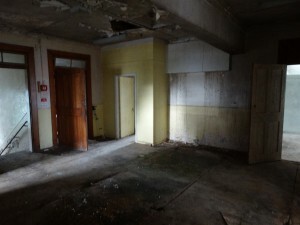 * The entrance room for that area became noticeably cold at one point during the investigation. It felt like walking into a fridge and both Kel and I noticed it. A few minutes later the temperature returned to normal. 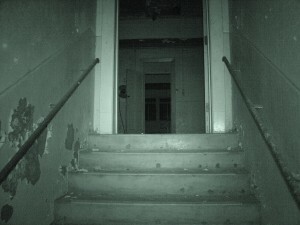 * Ian saw a shadow move in the room beside this (when there were no other people there). * Matthew heard a ‘cough’ whilst by himself in this wing. When I returned upstairs a couple of minutes later to investigate if there was a reason for the noise it had stopped and I couldn’t find anything that would have made it. 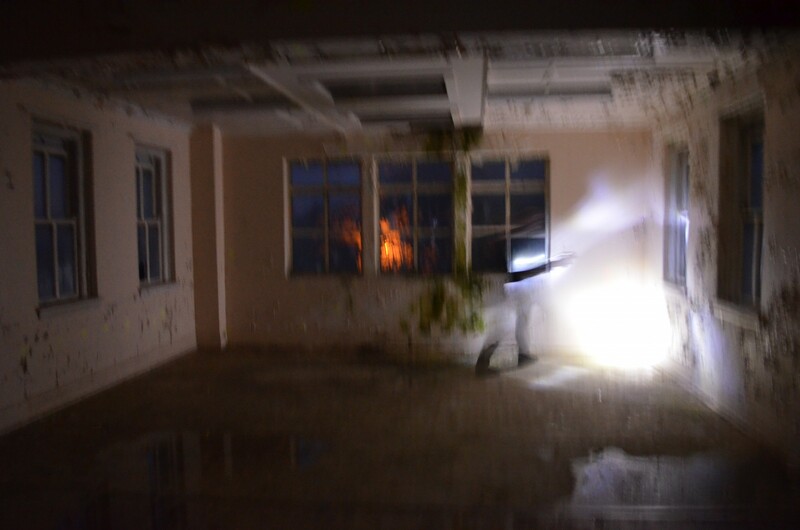 I also saw a “white blob” in one of the upstairs rooms. While sitting up in the main room upstairs monitoring the DVR setup, Amy and Jessie both saw something ‘walk’ behind the TV monitor screen that had all the DVR camera feeds showing on it. They both claimed to have seen it at the same time. Jessie – We saw it at the same time and then minutes after I saw it again. We could not explain this as Amy and I were the only ones in the building at the time as everyone else was over at the second building. We moved the DVR cameras so that the covered that area but we never saw it again, so it was not captured. At 9.40pm when Kel and Barbara entered one of the rooms within the Maximum Security building, they claimed that it felt like they had ‘walked into a fridge’. Both Kel and Barbara noticed this and commented at the time on how cold the room had become. Unfortunately at the time, they did not have a thermometer handy so was unable to document exact temperatures. Matthew had set up a trap camera in the room and was continuously datalogging at that moment in the room close to where Barbara and Kel had been. They reported to him that they had experienced a temperature drop in the next room. Further on into the early hours of the morning, Matthew reported capturing some interesting audio whilst spend time in isolation in a far part of the maximum security building Away from the others in the team. Matthew – The Mysterious Cough: I was alone in Villa 16, the Maximum Security building, and I was just about to take a break from monitoring my audio recorder through the headphones, and head back to the Admin building when I heard a distinct, male-sounding cough. To my ears it sounded human, and but I could not specifically tell what direction it was coming from. I remarked out-loud, saying “That’s a cough!” after it was captured on audio. Thinking it may have been one of the team, I went outside and walked back towards the Admin building. The layout of the two buildings, and the fences, is such that anyone leaving would always encounter anyone coming the opposite direction. Arriving at the Admin building, I found that all the team members were accounted for in that building, meaning I was by myself, over 100 meters from any other person when I heard the cough. Other than possibly a noise made by some sort of animal in the nearby native bush, I can’t explain what would have made the cough. Barbara and Kel remained in that area for about 20 minutes, recording and taking photos then went down the hallway to another area for a short time. Barbara – When we returned the room was no longer icy cold and had returned to a normal temperature. A couple of times during the later part of the investigation Barbara left a torch in cells after she had finished a communication session and demonstrated to any possible spirits there how easily the torch could roll and be moved. She then invited them to try to move it while no one was there. The torch did not move while she was away. A ‘Spirit box’ was used during one of the communication sessions. Barbara – After introducing ourselves we heard the name ‘Stephen’ very clearly. No other words were heard during the whole 20-minute session. The timing of that one word was perfect. During the same communication session we also had the studfinder turned on. We got a faint response for about a minute in the middle of the session, but nothing else. Amy – At one point Barbara and I were using the spirit box and when she called out ‘will you tell us your name?’ I heard a distinct voice say ‘Stephen’. It was very slowly said, and I got the impression (I don’t know why) that it was definitely that spelling rather than ‘Steven’. 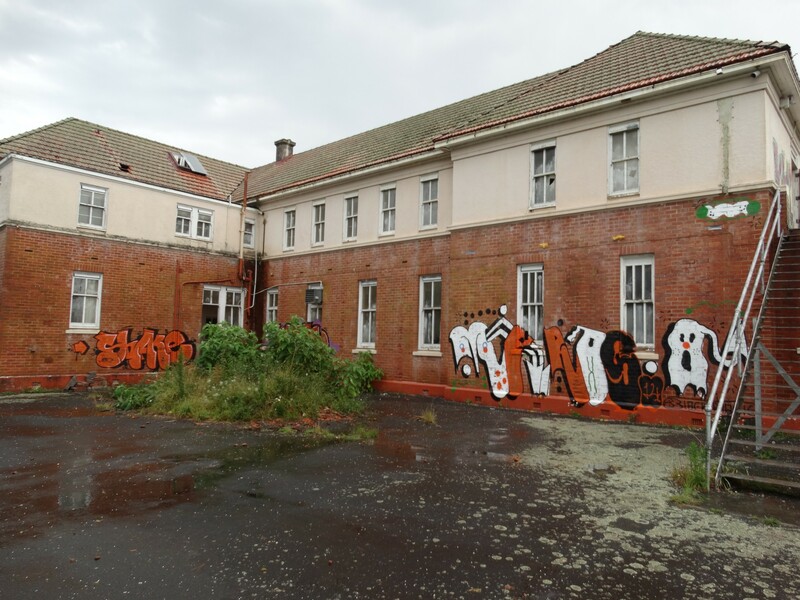 A lot of the recorded audio was contaminated due to noise from the newspaper crew who were doing a story on the Haunted Auckland team. EVP attempts were also affected by screams, noises and laughter which could be clearly heard from Spookers, and the neighbours had visitors leave at about 3am creating further noises and distractions. Pam – Overall I felt that Kingseat Hospital was an interesting but non scary place to investigate. I feel we did a thorough investigation of all the rooms available to us. There were some interesting noises and sounds, possible voices recorded and I’m looking forward to further analysis of these. We were promised by the met service a wild and thundery night, which occurred around us just not right at Kingseat. I would love to have seen if this would have enhanced our experience. I think the change in the building to business has possibly detracted from the atmosphere of the buildings, however I’m sure anything paranormal wouldn’t be taking that into account. Overall a really worthwhile experience. 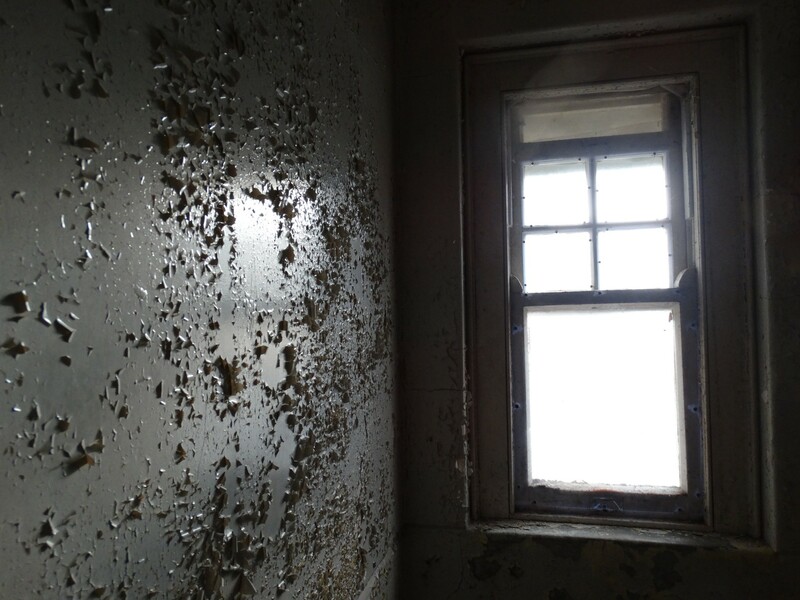 Kel – In conclusion I do think there could be residual energy remaining there, as residual energy can be absorbed by buildings, land and is also absorbed in the walls and object’s such as doors, windows, the cells and even the floor. I felt that there were a few entities, meaning 4 entities there. My findings are inconclusive as to whether the place is haunted or not due to the fact there is a lot of residual energy there. Kris – I think it went as well as could be expected. It is a big place, with a lot of floor to cover. It was an uncomfortable place to be. Dark, Dank and Dirty. I think we did good ground work, we know what to expect next time, and we know what areas attracted our attention. For me, the area that stood out the most vividly, was the upstairs, southern wing of the Maximum Security block. The place is grim indeed. Haunted intelligently? I don’t think so. However, I imagine if anything intelligent is here, it would be wary of human contact, and not the most trusting. Time will tell. 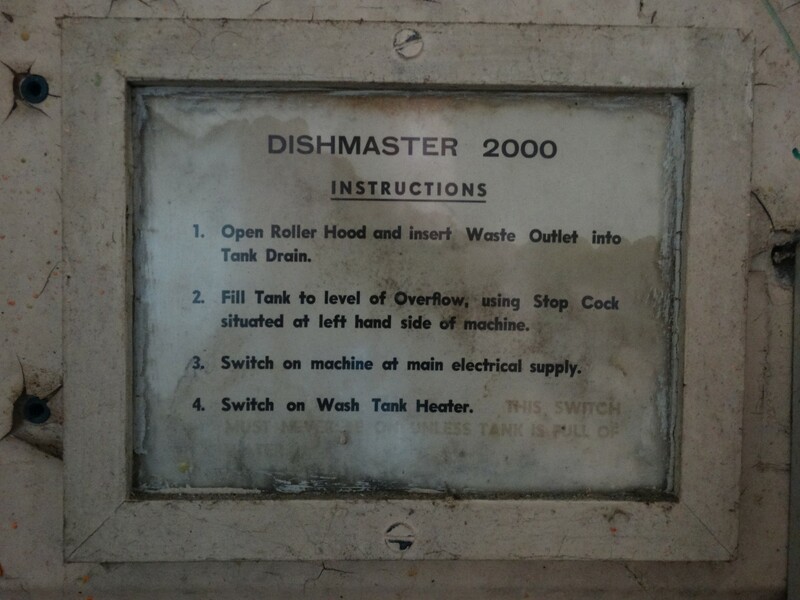 This was a stark reminder of life in metal heath in times gone by. I did, oddly enough, find myself quite comfortable to wander these halls and wards alone. There is not much more than I would add here, that I haven’t already touched on, in this report, or previous ones. Eagerly anticipating any following investigations. 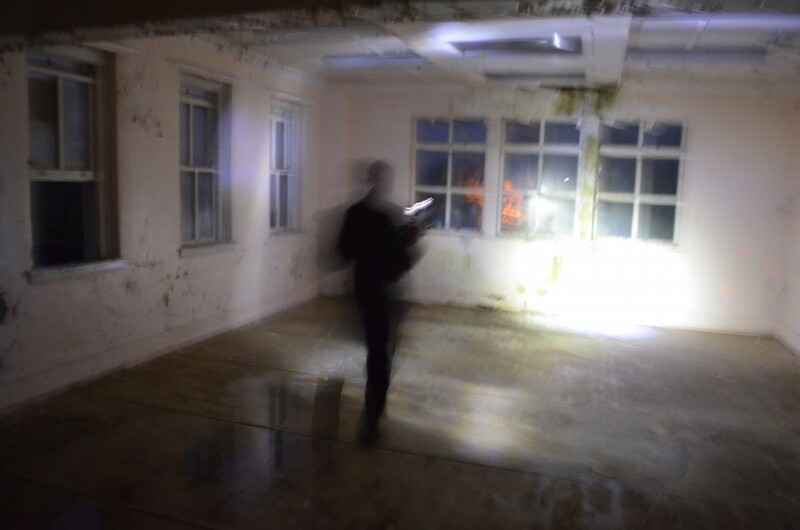 J.P – (Guest) I reckon there may be some sort of energy in the buildings, I felt like I was being watched or someone was standing behind me at certain times. 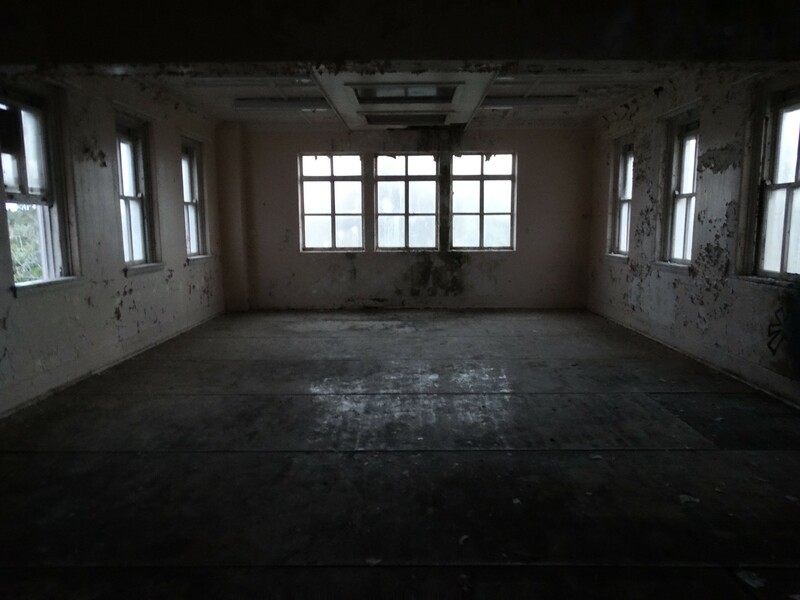 It was especially creepy on the 2nd levels in both buildings, maybe because they are relatively untouched, I don’t know… My overall feelings about Kingseat are mixed, I feel uncomfortable being there at times like I’m intruding but enjoy the history and the visual aspect of the complex. I sometimes think, knowing the intentions of the nurses and doctors were probably good, their methods being somewhat primitive in the dealings of the mentally ill have definitely left an imprint or vibe in the area. Jessie – As the building was very drafty, any temperature changes could be attributed to that. On reviewing my EVP sessions I found there was a lot of background noise of people moving near the mic or sounds of the building moving. On the first night as it had been raining but had then warmed up a lot of noise could be attributed to the wood moving and on the second night the wind was causing doors to slam and bits of the roof to move. There was also a possum making itself at home during an EVP session on our second night which could have caused the noises we were hearing. There was also a family living in the building next to the two Maximum Security buildings who had chickens, dogs and young children, all of which made an appearance on my recordings. I think the investigations went extremely well. There is a lot still there waiting to show itself, I believe and each time the activity goes up a notch. We went in the right size team to fully investigate the whole building at once and yet not too many that we just created contamination. The weather was against us both times but yet we still managed to get a little something each time. More time needed. Definitely more time. There is no much under the surface there that it’s all just waiting to come out. I feel this place has an amazing history and that some of the things that may have happened here may have left an imprint. There aren’t many stories that clouded my perceptions of the place going in so all of the feelings I had were purely based off my own experiences which was a good way to go into it I believe. I definitely feel there is something going on under the surface of this place. Each time we go, the personal experiences seem to increase and although we are yet to catch some decent evidence I think we truly have the potential to catch it there. 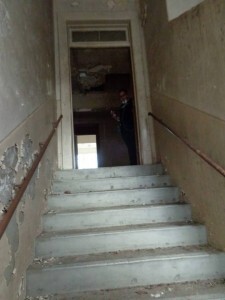 Whether the place is truly haunted or not is still open for discussion. I do not believe there has been enough going on to label it as such, but with further investigations and more time spent there this opinion could change. I do feel though that the place has been blessed, possibly multiple times and if there is anything lingering it would be residual. Kingseat as always is an awesome place to investigate. 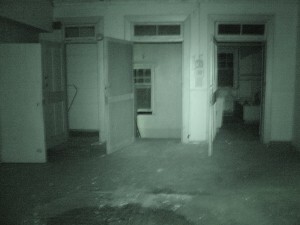 The history of the place is what truly makes it a prime candidate to have possible hauntings. Being able to investigate in what was the Maximum Security wing is really the icing on the cake. Knowing what could have gone on in there and what the mental state of some of the people could have been makes it all the more interesting. Walking around the building in an almost untouched state really allowed us to see what kind of place Kingseat really was, one could almost feel the history seeping out of the cracking and peeling paint. 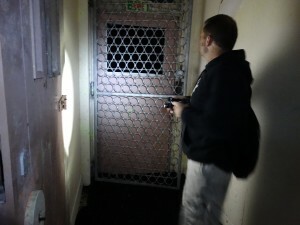 Being able to spend two nights in the Maximum Security buildings enabled us to be able to give each area a brief overview on the first night and have somewhat of a taster or each building and room and then on the second night being able to hone in our investigations to the areas that sparked our interest the first night enabled us to really give whatever is there a chance to reach out. It doesn’t really bother me that we were not able to get much in the way of evidence. Just being able to go through the building and have the personal experiences that I had made it worthwhile to me. I’m still very hesitant to label these buildings as haunted. I definitely feel a “presence” there and some odd things have happened but whether it could be labeled as a haunting or not is still up for debate for me. 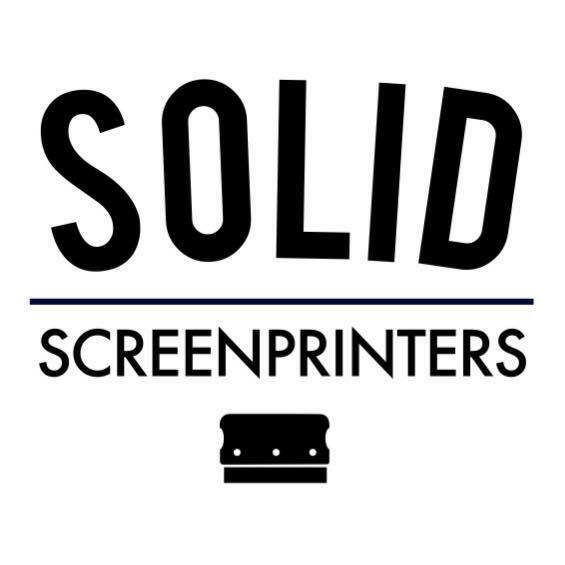 Amy – I really enjoyed the investigation. On a personal level it was great to get to know members of the team better and it was also fascinating using some of the equipment (spirit box, cameras). For a ‘newbie’ tagging along it is all such an amazing experience, and I had to almost pinch myself on occasion to make sure I knew I was really awake and spending a fascinating evening with a group of great people who are really passionate about what they are doing.Due to the history of the place I would not be surprised if it contained some form of paranormal activity. Too much tragedy for it not to have an effect on the area. In saying that I couldn’t say what form that activity takes on (unhappy spirits etc) but the ‘sadness’ in the place feels like it weighs quite heavily. Matthew – Despite its sinister reputation, I could not personally find anything overly creepy about the place. In fact sitting in solitude in the dark of one of the maximum security cells with my equipment, I found the location quite peaceful compared to the horror effects and décor at the nearby Spookers attraction. Perhaps the 20 foot high fences, designed to keep people in, have a way of keeping the rest of the world out, which when combined with the rural location and the darkness, had a calming effect on me. 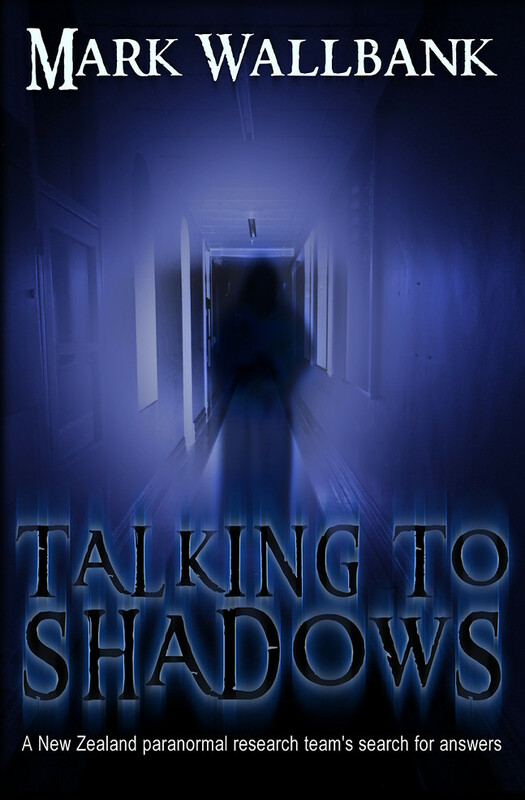 I focused most of my attention on keeping a solitary vigil in the cells with my recorders and cameras, and other than the unexplained cough, and the strange sound I heard with Barbara and Amy in the Admin building, I did not see or hear anything else unusual for the entire evening. As a sceptic of course, I seek empirical evidence to back up reports of hauntings, and my opinion is that it is Kingseat’s troubled history of patient mistreatment which has given it a dark reputation, and it is that reputation which had lead people to believe that the location must be haunted. 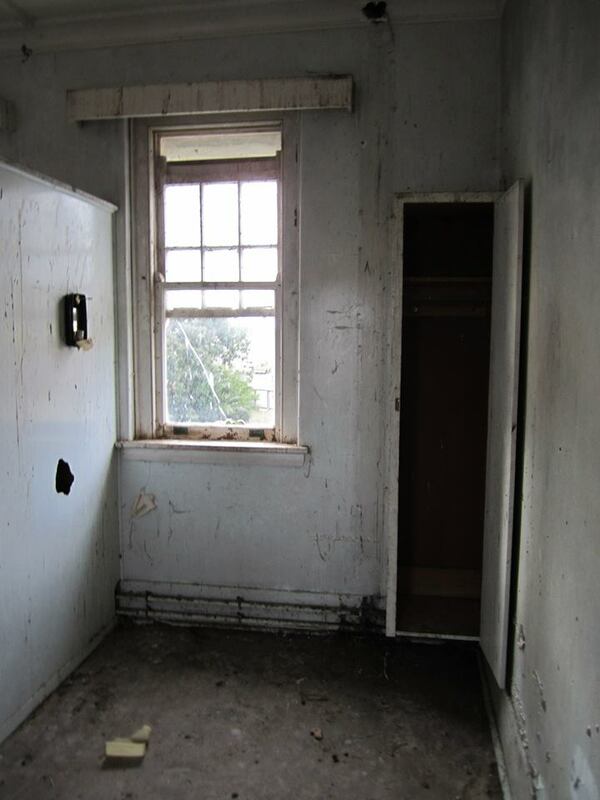 While there has been many reports, mostly by people who have heard the stories and gone seeking stories of their own, I can find little solid evidence to back up the claims that Kingseat is one of New Zealand’s most haunted locations. I thought both buildings felt very serene. I suspect that they have had Kaumatua or similar out to bless the buildings. 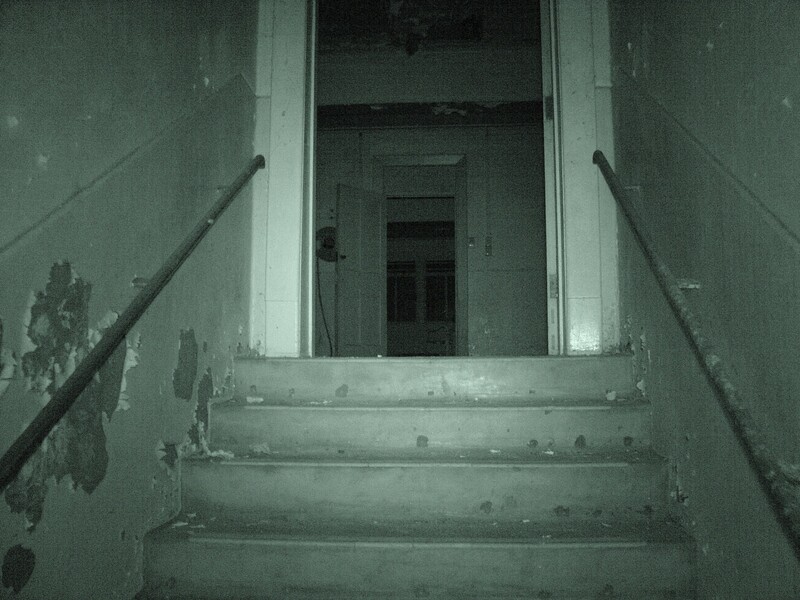 From what I saw and experienced during our short time in the buildings I feel that there may be something in the building but cannot say with any certainty if it is an intelligent or residual haunting. After the second visit I think that there could be a haunting at this building. We heard footsteps and I have a couple of good EVPs. Some areas have a definite feeling that there is an energy there. During our most recent visit I felt something move through me in the bathroom and there was a very noticeable temperature drop in the adjoining area later on. Kel also sensed an energy in that area at the same time. This was the same wing where Ian saw a shadow move and Matthew heard a cough. During our earlier visits in the same area Jessie and I heard and recorded the “laugh” EVP and on the first investigation members of the group heard footsteps during an EVP session. Taking everything into account from all our investigations, I think there is a definite possibility that parts of the rear building may be haunted. Mark – The place certainly is big, dark, menacing and disorientating in parts. If I had to make a decision as to whether the maximum security buildings are haunted, I would have to say no at this point. 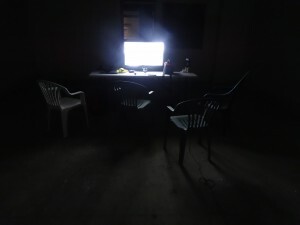 I didn’t see, hear, feel or sense anything I would label unusual during this long overnight session and felt rather comfortable sitting alone in the buildings in total darkness. However, the place certainly does seem to have an unusual ‘vibe’ going on. 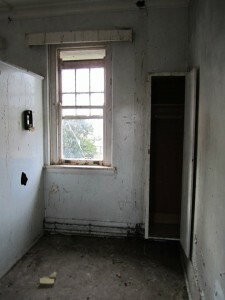 There’s an unnerving atmosphere and feeling that comes with entering certain rooms. Perhaps this is some form of ‘dark’ residual energy? Maybe it’s something natural or mundane that we as yet haven’t quite figured out? Some rooms just didn’t feel like they should. But, as usual, evidence and conclusions can’t be drawn from just feelings and anecdotal experiences. More conclusive evidence will need to be added into these investigations if we are to form any satisfactory conclusion either way, as to the haunted status of the building. During the 3rd session, I personally felt the team did well, worked together and achieved everything that we set out to do, with the knowledge and equipment we have to work with. The team will be spending more time within the buildings in the coming months to try and cover more areas and work on new theories and techniques, as well as trialing more equipment and further attempts to replicate or recreate the alleged activity from the past. So, the Maximum Security Buildings. Haunted or not? For now, Case still open! 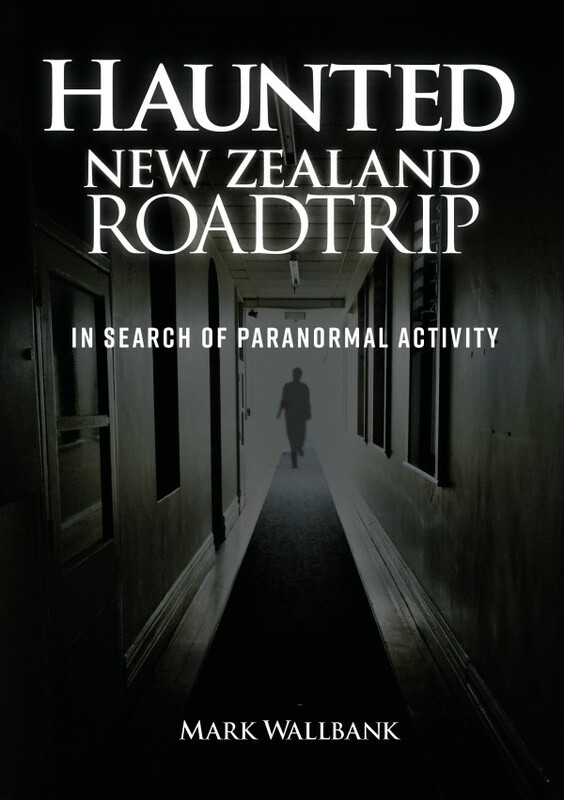 Note: Haunted Auckland are not insisting that these recordings are demonstrating any paranormal events. Only that, at the time they were not heard by anyone and on later analysis and discussion, the team were undecided as to the nature of the recordings. 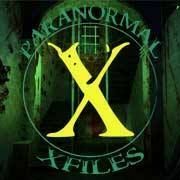 Check out our gallery of 100 Exclusive Photographs from our Paranormal Investigation of Kingseat Maximum Security.